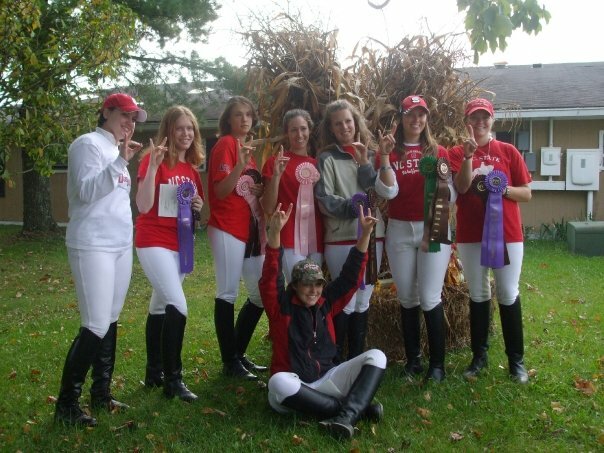 Lauren from She Moved to Texas (a fellow NC State Graduate and NCSU Equestrian Club alum) recently wrote about her experience on NC State’s IHSA (Intercollegiate Hunt Seat Association) team. 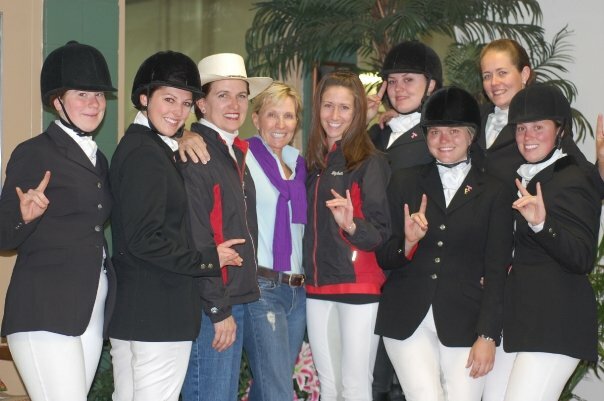 I was inspired by her interesting perspective to write about my own experiences on NC State’s IDA (Intercollegiate Dressage) team, which has had a huge impact on my life, and especially on my riding. Two teams of 4 riders compete, 1 rider in each division (Intro, Lower Training, Upper Training, and First Level). Each rider completes one test, and the score of that test is considered for both the individual, as well as averaged for a team score. The lowest score on the team will be dropped. Each rider draws a horse provided by the hosting school, and has 10 minutes to ride that horse before completing their test. 10 minutes might sound like a lot (especially compared to IHSA, which doesn’t allow any time at all! ), but considering that the horse and rider and still judge together and so things like forwardness, suppleness, energy etc will be judged, that 10 minutes flies by! My first year on the team was great fun, but also a huge kick to my ego. My teammates were my best friends, and we all had stupid nicknames (mine would not be appropriate for this blog 😉 ), and tolerated each other’s imitations of dressage movements when we’d had a little too much chick beer at a party (um, hello drunken canter pirouette). I got to show just a couple times, and found that I sucked, even though I thought (the operative word here) I had been schooling 2nd and 3rd level movements in high school. I started in Lower Training (Training tests 1 and 2), and the horses being used were nothing like I had ever ridden. They were mostly stiff, aging TB types, with your average QH or Appendix thrown in here and there for spice. I had no idea what to do with that, so I turned my attention to working with our trainer’s Friesian in my spare time as a way to be helpful and not feel like a terrible rider (even though I cringe at my equitation now!). 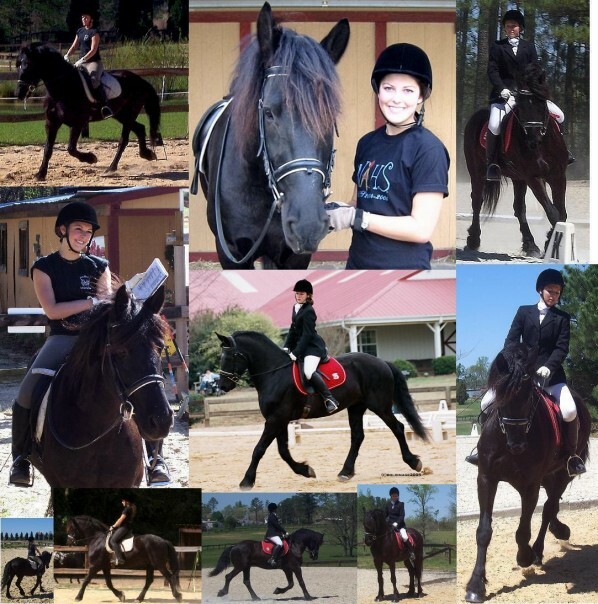 Yes, I so loved this horse I made sappy photo collages of us together. Somewhere in my sophomore year, something clicked. I learned to adjust my riding to the horse I was on, and figured out that these old TB guys were stiff, but they knew their job, and I learned how to sit pretty and finesse my aids. Suddenly, I was placing much better. I had been to just two shows and the year looked bright, when I ended up with a broken ankle that took me out the rest of the season. My junior year rocked and I pointed out of Lower Training and into Upper Training (Training 3 and 4). These horses I knew- they were mostly upper level rejects or aged Grand Prix horses. Let me qualify this by saying I had never ridden an upper level horse before, but they were a bit bulkier, with shorter necks (not quite Haflinger or Irish Draught length, but short enough), and I felt like I had a job to do, which gave my confidence in the saddle. Even better, my best friend was our Coach, and the whole team started to place against some of the IDA mega-schools (St. Andrews University, Virginia Intermont, and Virginia Tech all had very well developed IDA programs, compared to NC State’s fledgling group of 10 or so). Senior year was one of the best ever. 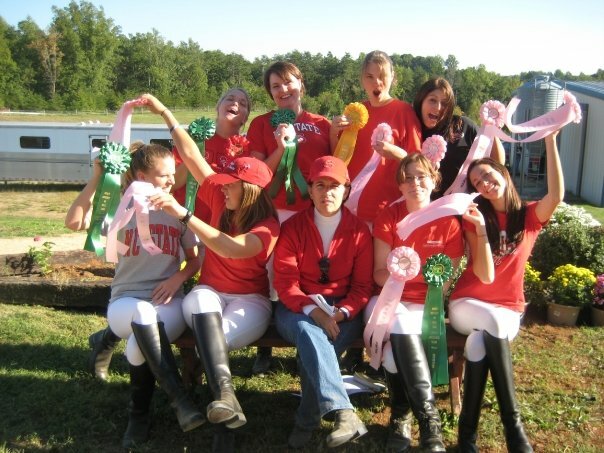 I took over as student Coach/VP of the Dressage Team (at that time a division of the over branching NC State Equestrian Club), and learned that I love coaching and giving lessons. I improved my eye helping and watching other riders, and taught myself how to battle show nerves through the struggles of helping them relax. 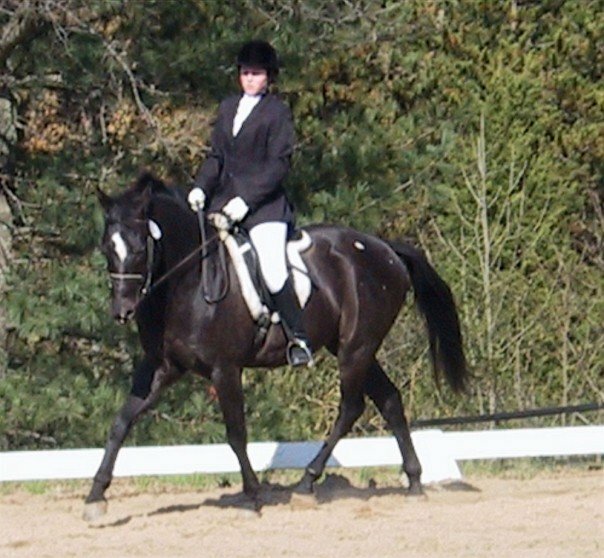 I became even more flexible in my approach to riding as well as coaching, and emphasized softening my hands and leg to encourage relaxation, which translated into the show ring with my own horse as well. 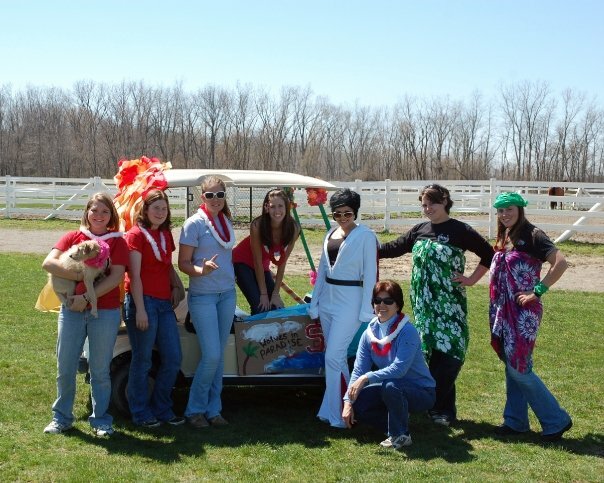 That year, the team beat all odds and was Reserve Champion of our region- we were going to Nationals. I won’t spend too much time on Nationals, but it was truly something to behold. 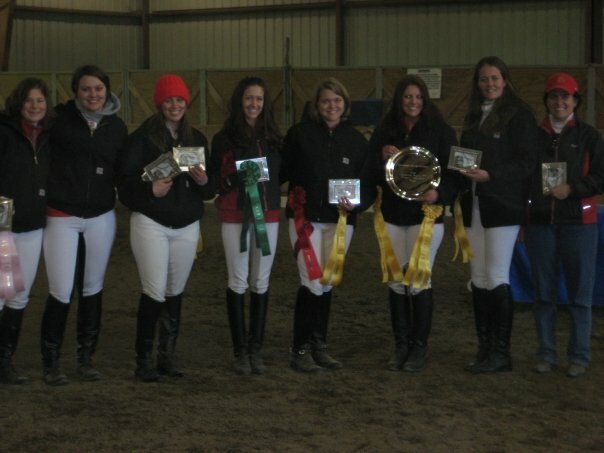 Watching other collegiate riders who were so good was awe-inspiring, and the sense of community we felt as a team and the fun we had with other schools of our region was something so unique and amazing – it’s not often we really feel the team spirit as equestrians! While I did not have the best ride, I am so thankful to have been able to experience Nationals, and will always remember the pride I felt for my teammates and fellow riders. 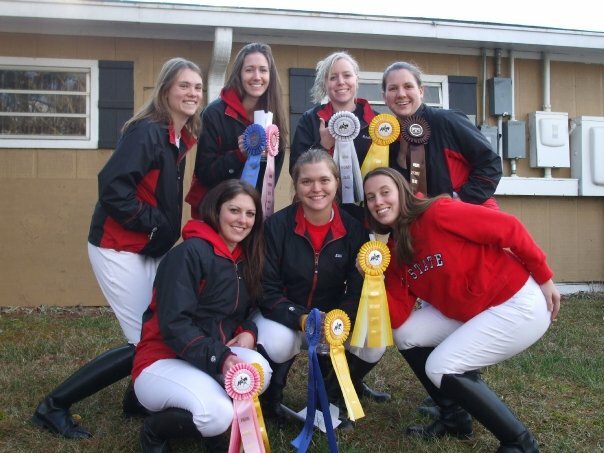 Unfortunately, my super senior year I was ineligible to compete (you only get 4 years, even though one was with a mostly broken ankle), so instead I became President of the newly formed NC State Equestrian Dressage Club. I’ll admit it was hard not to be competing, but I wanted to leave the team (now club) with the best that I could, and organized a huge recruiting effort to garner attention for the tiny club. Now I believe the team is bigger than I left it, and I love that it appears to be thriving! While there were struggles with it, just as there is with anything, I think IDA is a wonderful organization that offers riders a rare chance to hone their skills on a variety of horses, and maybe even continue riding when having a horse in college is not an option. 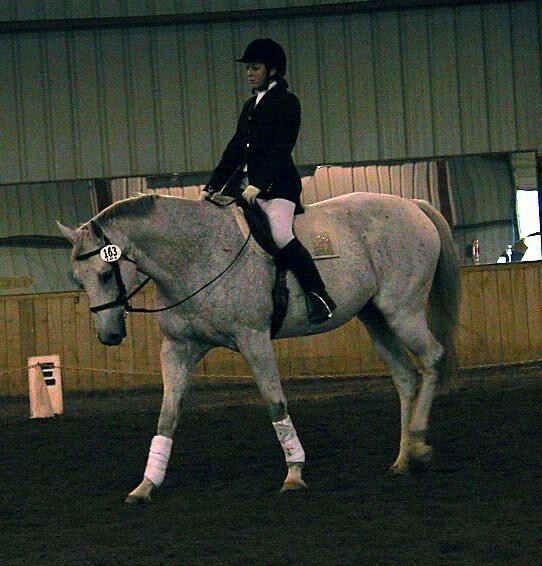 My style of riding is based on the knowledge I gained through IDA, and my school pride and appreciation for dressage has never been more, mostly thanks to my time as an NC State Dressage rider, and I would highly recommend the experience to any equestrian. With that said, gooo Wolfpack Dressage! 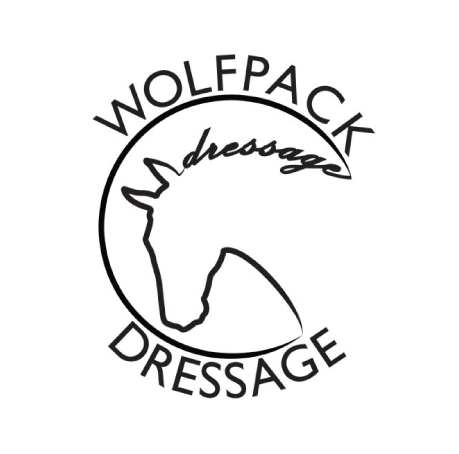 If you want to learn more about Dressage at NC State, visit their facebook page here. For general information about IDA, check out their site. Oh how I loved G! His favorite thing to do was kick out when you asked him to canter- I remember taking him to MacNair’s (center pic) and the judge commented “Brave Ride!” 😀 I believe he went on to be a Western horse- which I think would somehow suit him well! Love it Britt!!!! 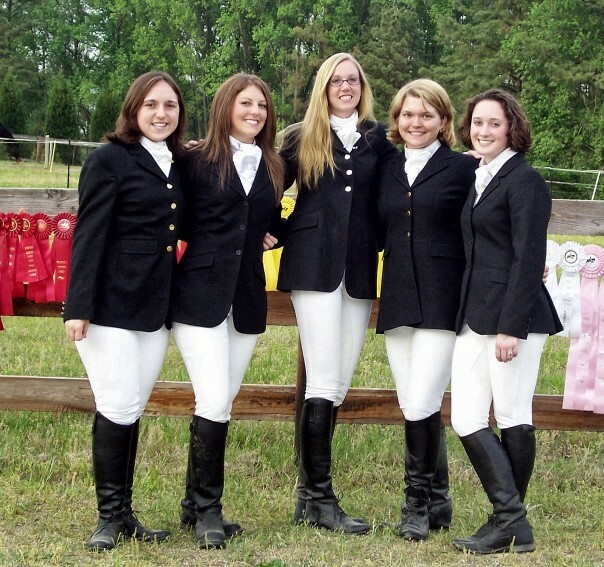 The Dressage team was better than any sorority a girl could be a part of 🙂 (or frat if there had been a boy on our team…) We def were there during the “transition” but so glad where the team ended up and is going!!! Thanks for the memories!